Mihama American Village in Chatan is best known for its beautiful sunsets, photogenic spots, romantic illuminations, and myriads of other attractions. The waterfront path from the Fisherina to Sunset Beach and further to Araha Beach is popular among joggers and people enjoying a walk and refreshing ocean breeze, especially in the mornings. Starting on Sunday, Mar. 31, a new regular morning event is inaugurated in the American Village that is sure to be welcomed by the folks enjoying the area. 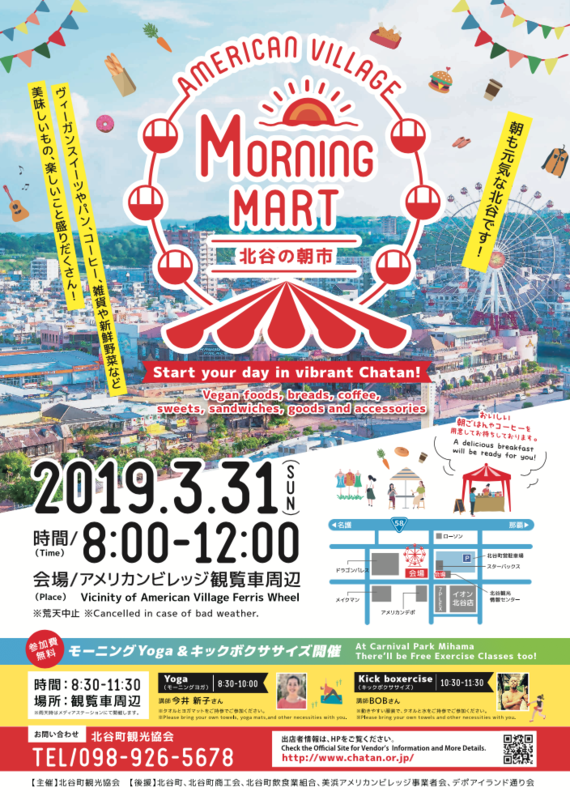 That is the day the first American Village Morning Mart is scheduled to take place in the area surrounding the Ferris wheel from 8 a.m. to noon. 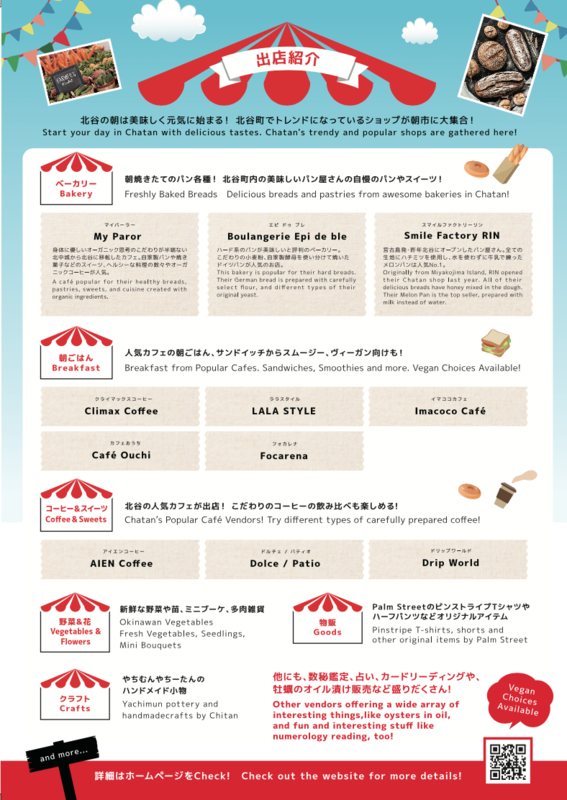 The food area of the event will be located in the vicinity of the Chatan Information Center and Starbucks offering delicious foods from a variety of shops in Chatan, such as baked goods, specialty coffees, vegan foods, sandwiches, veggies, and other delights. Other vendors will be offering handicrafts and other interesting stuff. Across the street, on the first floor of the Ferris wheel building, there are free classes of morning yoga and boxercise, helping participants to start their day with an energy boost. Everyone is invited and participation is free. Come enjoy the food and exercise at the American Village Morning Mart from 8 a.m. to noon. The Morning Yoga session takes place from 8:30 to 10 a.m. while the Kick Boxercise is from 10:30 to 11:30 a.m.
Everyone joining in the classes is asked to wear comfortable clothes. Bring your own yoga mats, towels, and other necessities.